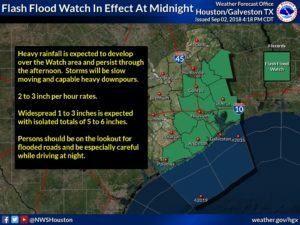 The National Weather Service has issued a Flash Flood Watch for portions of southeast Texas including #MCTX from midnight tonight through Monday evening. Slow moving thunderstorms are expected to develop producing periods of heavy rainfall. Deep tropical moisture will spread over the region tonight and Monday fueling the development of storms beginning around midnight. These storms will be capable of 2 to 3 inch per hour rainfall rates given the moist environment and slow movement. Rainfall totals of 1 to 3 inches can be expected with isolated totals of 5 to 6 inches. Street flooding is possible, remember Turn Around, Don’t Drown. The storms should weaken by late Labor Day afternoon. Hurricane Season Starts June 1st; Get Prepared! Have you registered your cell phone to receive local emergency alerts? Severe thunderstorm warning in effect until 3:30 p.m.
Missouri City wants to partner with all of its citizens and businesses to assure we all are prepared in times of emergencies.  Join us by signing up for emergency notifications and by volunteering your time.